Over at the ever popular online bingo 888 Ladies Bingo website they like to make their players feel welcome whenever they play, with great games. promotions and offers. This is never more so true than when new players join the bingo website. 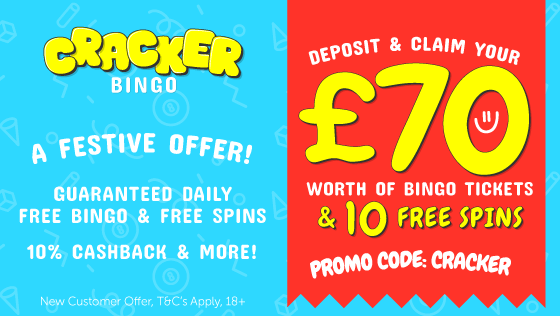 In the first instance, new members can actually play bingo for £888 in prize money for free with no deposit needed. Then when you want to start playing for more serious prize money simply deposit £10 and play with £40 at 888 Ladies. This is a great 300% cash match welcome bonus offer that is made up of an online bingo bonus and an online slots bonus. You can, in fact, take advantage of this offer from making a deposit of as little as £5 or up to the maximum of £100. You will then receive a 150% cash match in bingo bonus and a 150% slots bonus. So you get the best of both worlds here. Therefore, you could be starting your play at 888 Ladies Bingo with as much as £400 in your account in total. Once you arrive at the 888 Ladies Login / homepage you will need to click on the join now button so that you can complete their online registration form. Simply fill in all the required details including your credit or debit card so that you can make your first deposit and take up the 888 Ladies 300% welcome offer. As with all online bingo websites, when you take up a welcome bonus offer you must meet the sites wagering requirements before you can make a withdrawal in real cash. There are a lot of sites that have high wagering requirements, however, at 888 Ladies you only need to wager 2x the initial deposit + the welcome bonus for the bingo part of this offer and 50x the games bonus. Once you have met the requirements you can withdraw these funds including any associated winnings as real money. 888 Ladies is a great fun site and is part of the same network of online bingo websites that include such as Wink Bingo and Tasty Bingo. 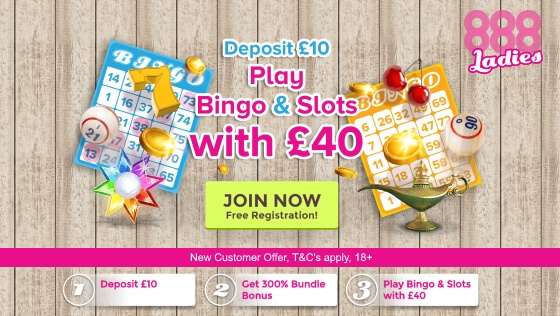 There is a great selection of bingo to choose from and a vast array of online slots so plenty of reason to join their site today. Click the button below, register and deposit £10 and play with £40 at 888 Ladies. Full terms. conditions and wagering requirements can be found on the 888 Ladies website.